A big thank you to Deanna at HarperCollins.ca for sending me this book. 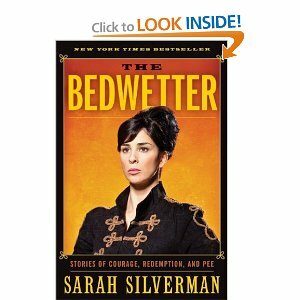 Before reading this book, I really wasn't all that familiar with Sarah Silverman. It seems there is quite a large number of comedians out there that I have never heard about! go figure! I guess the reason I am so surprised that I have never really of her is because she is actually very, very funny. Unfortunately, there are comedians who seem to be extremely popular who are, frankly, very boring to me - but this is NOT the case here. As I started reading her book, I found myself laughing like an idiot - at the most silly places. I have always admired the guts and courage it must take for comedians to get up on a stage and 'try' their acts out. It must be extremely scary. I like the style of writing in this book- Silverman pretty well writes the way she talks and I also loved the pictures (I am a big fan of pictures). The one thing that did surprise me about this book is that for all the humor - I sort of felt a little bit of sadness at times - and i am not quite sure where this came from. I once read that comedians are actually, in many instances, somewhat depressed people who hide behind the comedy - maybe this is true in this case? don't know, but overall, this book was a great read. When I saw that title, I thought you were reviewing a children's book, so the cover startled me. I bet the author is laughing to keep from crying. The book sounds good! I also thought it was a great book. Certain lines had me laughing over and over.